The use of Lden to assess traffic noise impact is simply incorrect. The Lden metric was developed for noise mapping purposes ONLY and NOT as a metric to assess ‘the degree of noise change’ created by a proposed road scheme. It would appear that much of the Irish guidance produced by the NRA/TII continues to suggest its use (using a design goal of Lden=60dB), however the Lden metric is simply too coarse of a metric and is not fit for this purpose. 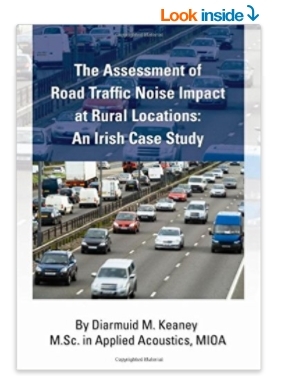 To read more on this subject, see our book ‘The Assessment of Road Traffic Noise Impact at Rural Locations: An Irish Case Study’ Paperback – 2013′. To look inside, click on the picture below…….